Knowing how to use a fire extinguisher could save your life in an emergency. However, before you use a fire extinguisher to put out a fire, it’s very important that you determine whether or not it’s appropriate for you to be fighting the fire, and whether or not you'll be able to put it out. If you don’t think you can fight the fire, or if you have any doubts, evacuate the building immediately and call the fire department. The fire extinguisher can be located at the motorhome entrance. Stay a safe distance from the fire and near an exit. Stay close to the floor to avoid heat and fumes. The chemical from the fire extinguisher will shoot at least 10 feet (3 m). Pull the safety pin and grasp the fire extinguisher firmly while holding it in an upright position. Aim the fire extinguisher nozzle at the base of the fire. Do NOT spray at the smoke or flames. Sweep the fire extinguisher from side to side until the fire appears to be out. After the fire is out, beware of flashback. Flashback occurs when flammable vapors from combustible liquids spread back to the ignition source and reignite the fire. Once the fire is completely extinguished, discharge the fire extinguisher entirely and get it recharged or replaced immediately. 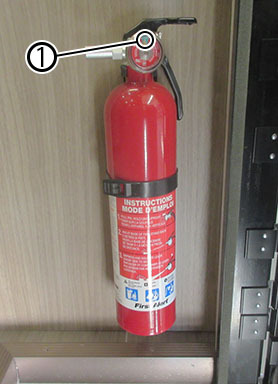 For detailed information, refer to the fire extinguisher manual provided in the Motorhome Information Kit. Fire extinguishers are designed to put out a fire in its initial stages. Once you cannot get within 10 feet (3 m) of the fire, it is out of control and too big to fight with your extinguisher. Do not discharge your fire extinguisher to test it. Once it is discharged, even for a few seconds, it will lose pressure and become useless. Periodically check the pressure gauge (1) on your fire extinguisher. If it loses pressure, the dry chemical will not effectively discharge. Do not operate or occupy the motorhome without a fully charged fire extinguisher. If the pointer on the pressure gauge is not in the operating range (pointer in the green portion of the gauge), immediately replace the extinguisher. Record the inspection date on the tag provided.